Starting up your own blog is so easy it seems everyone is doing it, with just a few clicks you’re online and ready to unleash your thoughts/wisdom/ranting upon World Wide Web. Although it may seem that even Bozo the Clown can have his own blog but if you want your blog to be successful and you want people to find and read your blog there’s a few things you need to consider first. Before you publish your first post, before you sign up for your blog account, before you even switch your computer on you need to think about what you’re going to blog about. Think about what you want your blog to say, is it going to be a professional blog? Do you have a political opinion you want to get out there or do you just want to talk about your day to day life? Whatever it is you want to talk about you can be sure there’s a thousand other blogs out there already talking about the same thing so what’s going to make your blog different? You also need to work out how much time you’re going to dedicate to your blog too. You can’t publish a post every day for a month then leave it for six months, the search engines aren’t going to like you and neither are your readers so pick a realistic time schedule you know you can work with and stick to it. Now you know what you want to talk about you need to look at what your competitors are talking about and how they’re doing it. Look at the different styles of writing and think which ones you prefer and look at what you don’t like. The chances are other people are going to have the same reaction as you so incorporate the good things and make sure your blog doesn’t include the bad things. Also look at the layout and how their blogs are presented, you might decide to have Adsense on your blog to make a bit of pocket money but look at how others are doing it so you can strike a balance between too dull and boring and too over the top. You don’t want to bombard your readers with so much information they run away screaming but at the same time you don’t want them falling asleep before you page has even finished loading. Now it’s time to chose a platform and a blogger host, the two more popular options are Blogger and WordPress but you need to do your research and decide which one is going to be right for you. Blogger is another one of Google’s free offerings that comes tied to your Google account but if you don’t want .blogspot.com in your URL then you’re going to have to pay (but it’s not too expensive). It’s simple and easy to use and comes with Adsense so you can make some cash off your blog as standard. The other popular option is WordPress which offers a slightly more sophisticated option and you manage everything through an easy to use back end admin system. Like Blogger it comes with a set of sample templates to get you set up but it’s quick and easy to add something more original. OK, now you can start writing, unleash your genius upon the world. Don’t forget blogs are meant to be fun. Write like you’re talking to someone rather than following the strict rules of English grammar and prose, always try and make your headlines a little bit snappy and once you’ve got a few posts up syndicate your blog round a few blog networks and set up some social media accounts to back you blog up. Don’t forget to make sure you’ve got some sort of tracking like Google Analytics (another free Google toy) to make sure you can see how much traffic you’re getting and where your traffic is coming from. This is very good advice. One thing I would add to it is to think carefully about the blog name. In particular whether the blog will be use your name, something specific to the niche you are talking about, or a more general name. This is important because, for example if the blog name and subject matter is too specific, it can be difficult to find things to write about. 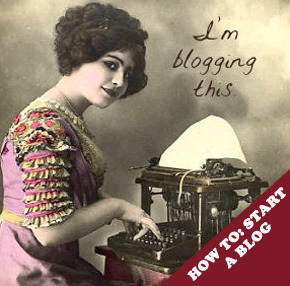 Hi Jessica, this is good guide to launch your first blog. For all things on life, you need to be organized and your post helps with this situation :). Thanks for sharing. Thanks for your Tips. I’m planning to start my own blog about piano, piano music and all about music. Since I’m an audiophile, I think this kind of blog will really suit me. I wonder which blog host will suit me? Any advice? Thank you~! My advice to those starting a new blog is to pick a good niche, and by good niche I mean one that is potentially profitable, one you would enjoy talking about at length and for at least a year or two down the line. Think products, not info. For example gadget and tech sites tend to do well, but the trick is to pick a sub-niche within this bigger topic as it’s quite saturated at the moment. Dig deep and think of what’ not being done that you could do. Get creative and pick a winning niche. Start there, then work forward.